We do not require space rental fees, however we do have minimum food and beverage minimums based on the date and amount of space you reserve. We have limited dates where we will do a "buy out" of our entire restaurant - please contact Kelly at *NOT DISPLAYED* to discuss. We require 50% deposit to reserve our space. 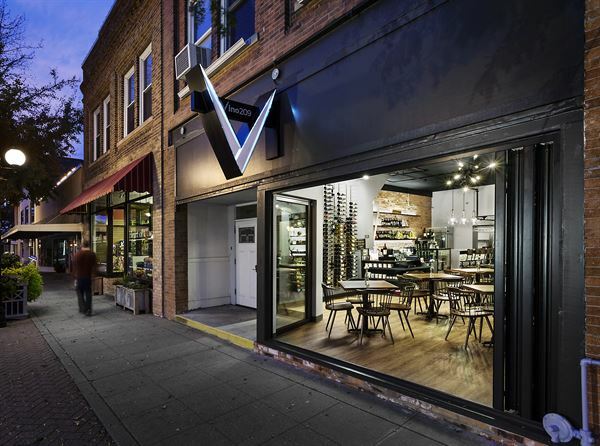 The Café was been designed by Des Moines architectural firm FEH Design. Architects Cory & Denny Sharp, along with Interior Designer Michelle Crambilt took special care to showcase the historic aspects of the building, using the natural brick as a major design element. The stunning modern bar brings forth in the space the sleek sophisticated element that Owner, Kelly Sharp was seeking. The moveable front doors will allow for the patrons to feel part of the fabric of the district and what is happening on the street. There is space for 40-50 guests and the space can be configured for seating or standing at high top tables. Special Features: We can accommodate private and semi-private events. Minimum purchases from $300.00 and up are required based on the date, space reserved and date. In certain circumstances a "buy out" of the space may be accommodated. This is a perfect location for birthday celebrations, business meetings, bridal or baby showers. Minimum purchases range from $100.00-$300.00. Atmosphere/Decor: Historic/sophisticated party room. Seating includes table and/or also a small sofa for cozy get togethers. Guests can pre-order form our catering or standard food menu. Special Features: Historic District with a variety of restaurants nearby in addition to shopping and special events.